Sharone was born of a humble family in Kawangware. As a young girl in school, she was quiet and afraid to express herself. 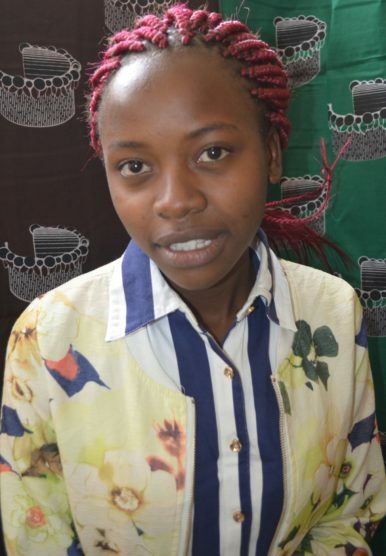 However when she joined Karatina Girls High School, she made a bold step and became a member of the Journalism Club which helped her gain confidence and self-esteem. She was appointed a prefect for three years in school and learnt leadership skills and other attributes that she treasures to date. Upon completing high school, she went through a phase of disillusionment as she struggled to figure out what to pursue as a career. Lucky for her, she met many people who encouraged her to move on the continue with her life purpose. She has a dream of giving her parents a better life, being a motivator to youth who have gone through similar humble beginnings, and truly being a role model. She is now walking with her Mentor Lucy for a period of one-year – an experience that is truly transformational. Look out for a new Sharone!